Traditionally used in Herbal Medicine as a mild diuretic to help relieve symptoms associated with minor urinary tract infections, such as burning sensation and/or frequent urination. Used in Herbal Medicine to help relieve symptoms associated with minor urinary tract infections, such as burning sensation and/or frequent urination. Traditionally used in Herbal Medicine to help prevent (recurrent) urinary tract infections (UTIs). (Used in Herbal Medicine to) help(s) prevent recurrent urinary tract infections (UTIs) in women. Provides antioxidants for the maintenance of good health. 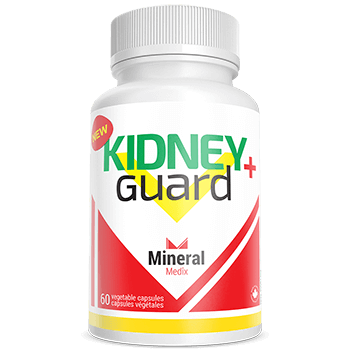 Mechanisms of action: Urinary infection may be caused by several strains of bacteria, which the ingredients of KIDNEYguard+ act against. Cranberries and D-mannose prevent bacteria from infecting the cells of the urinary tract, while Uva Ursi exerts a complementary action and reduces the total virulent bacteria load. The anti-inflammatory properties of Uva Ursi allow quick alleviation of symptoms. Adults: Take one (1) capsule two (2) times daily. Use for a minimum of 4 weeks to see beneficial effects. Do not use if you are pregnant or breastfeeding. Consult a healthcare practitioner prior to use if you are taking blood thinners, if you have a history of kidney stones, if you have a liver disorder, fever, painful urination (dysuria), spasms, or blood in urine. Consult a health care practitioner if symptoms persist or worsen. Store in a dry place in a tightly sealed package at room temperature. Keep away from children.